Heat oven to 350°F. In resealable food storage plastic bag, combine taco seasoning mix, oil and 1/4 cup of the water; seal bag and mix well. Add chicken pieces; turn to mix. Refrigerate 5 minutes or up to 12 hours. In medium bowl, combine 2 1/2 cups of the Monterey Jack cheese, cilantro, salt, ricotta cheese, chiles and egg; mix well. Heat large nonstick skillet over medium-high heat until hot. Add chicken with marinade; cook and stir 5 to 10 minutes or until chicken is no longer pink in center. In ungreased 13x9-inch (3-quart) glass baking dish, combine 1/2 cup of the salsa and remaining 1/4 cup water; mix well. Spread evenly in bottom of baking dish. Spoon 1/3 cup cheese mixture down center of each tortilla. Top with chicken; roll up. Place filled tortillas, seam side down, over salsa mixture in baking dish. 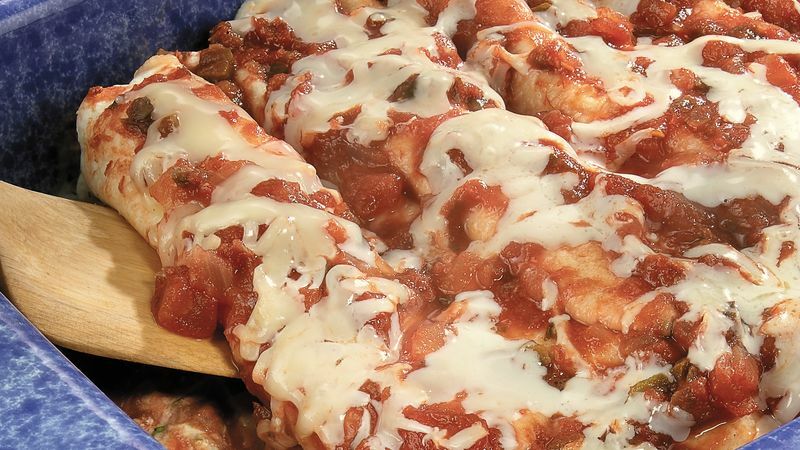 Drizzle enchiladas with remaining salsa. Sprinkle with remaining 1/2 cup Monterey Jack cheese. Bake at 350°F. for 20 to 25 minutes or until cheese is melted.